From breakfast through to a late night meal, the Right Bank features a diverse range of Paris’s eating delights. Paris was traditionally divided into two personalities by the river Seine that runs through the city’s centre. La Rive Gauche, the Left Bank, is famous for its historic artistic residents – Hemingway, de Beauvoir, Beckett and the other struggling writers and musicians who frequented its famous bars and restaurants (and its bucket list sites like the Eiffel Tower and the Latin Quarter). La Rive Droite – the Right Bank – was known for its wide boulevards and old money. But times have changed and now the Right Bank has become the heart of Paris’ most vibrant neighbourhoods - and artists and musicians have been gravitating towards la Rive Droite for a while now. It’s also on the Right Bank that you’ll find some of Paris’ most interesting restaurants, its most famous food, and the city’s hidden gems. Below is a small selection of our favourites from across the Right Bank’s arrondissements. 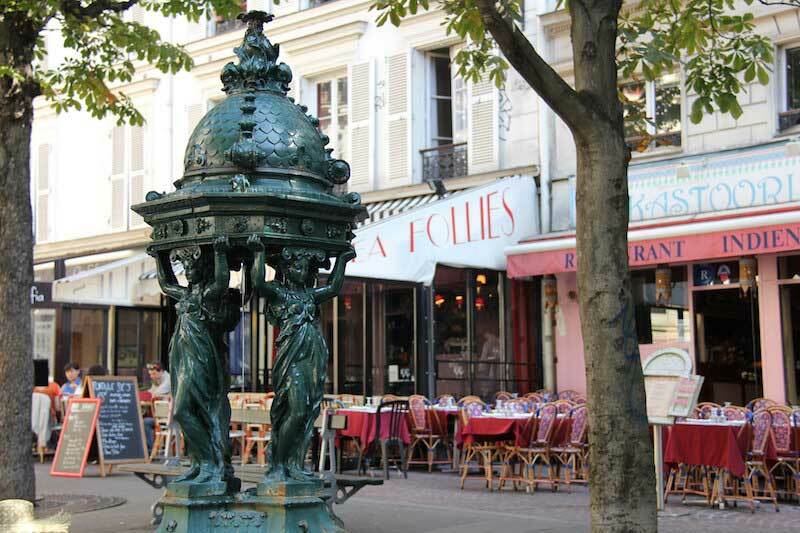 Le Marais, Pigalle, Montmartre are full of the best places to eat in a city famous for food. 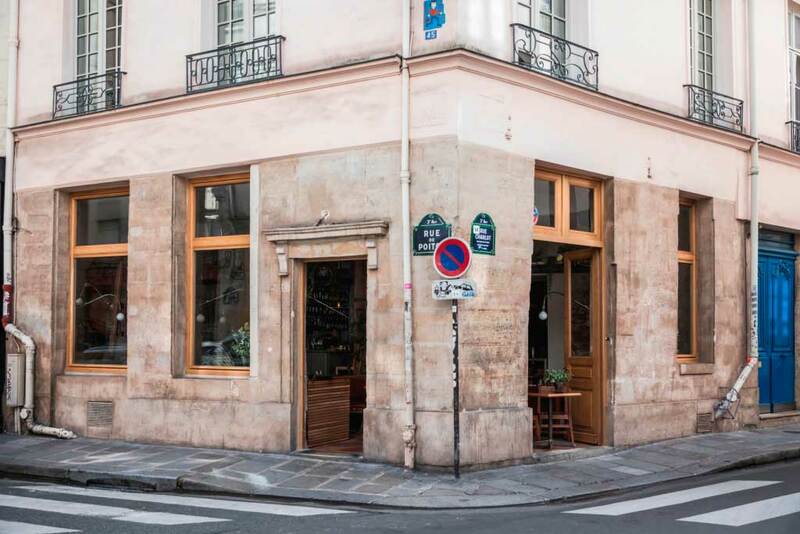 Le Barav provides a quintessential Parisian experience and lets you blend in with the locals. It’s a wine cave (think boutique wine shop) attached to a bar and restaurant that serves cheese and charcuterie platters. It’s where the Right Bank Parisians go for a casual catch-up to sit on the tables that line the cobbled streets in the heart of le Marais. With the help of a sommelier, you pick one of the unique wine offerings off the shop shelf and pay a bit of corkage on top of the retail price. 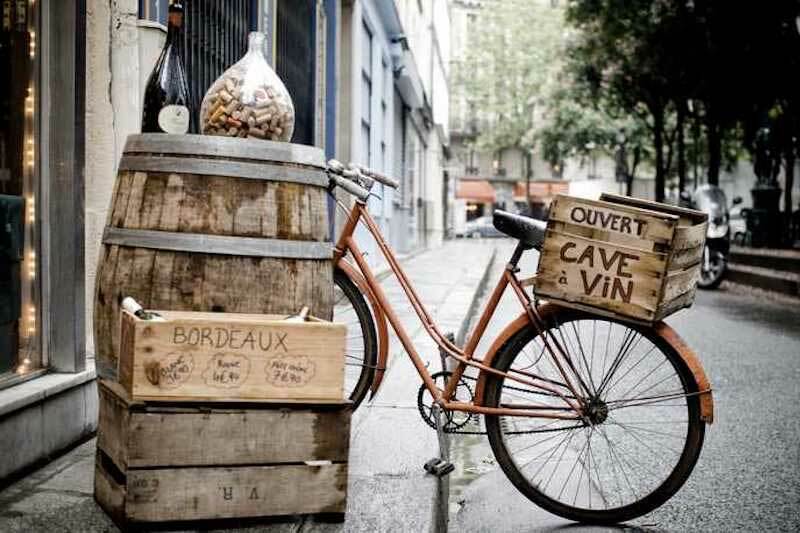 Settle in with some cheese (always put butter on your baguette before adding the fromage) and a beautiful Bordeaux, and watch the world walk by. The owners are lovely and will make you feel like you belong there. On your way out, grab another bottle to take home. For a very long time, Paris’ coffee was very bad. But in the last five years the French capital has been dragged into the future, and now the cafés on the Right Bank have embraced modern coffee culture. 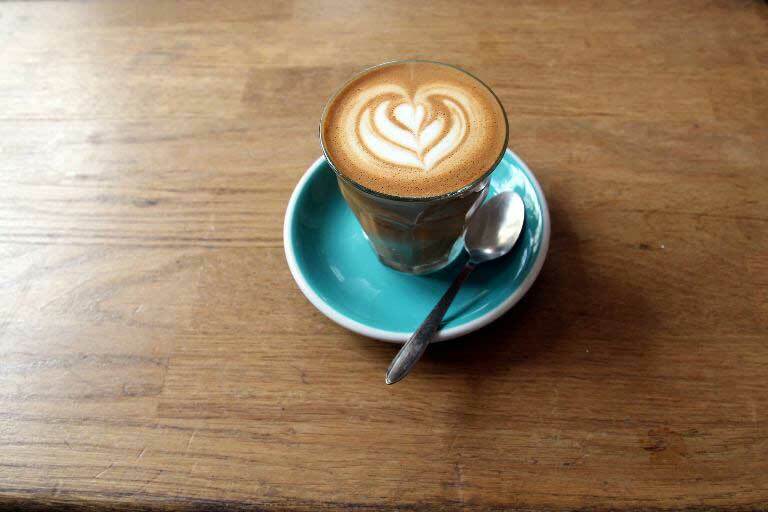 On the beautiful Place Lino Ventura is KB Cafe, which serves delicious creamy flat whites and rich drip coffee from its own roastery. They also have a wonderfully simple breakfast and lunch menu (get the toast with yummy homemade jam) and a delicious selection of cakes. Log into the wifi and post a picture of your croissant. Pigalle in the 9th arrondissement is the hippest part of Paris, full of the best new restaurants and bars. It’s the best place to go if you’re looking for something to do late at night, and the best place to get a late night meal is Le Depanneur Terrasse. Their simple yet perfect burger and fries is the best way to start or end an evening in the 9th. Find a dark booth for something intimate, or sit on the terrace and watch the weekend get warmed up. The Marché des Enfants Rouges in the north of le Marais is Paris’ oldest covered market. It’s full of beautiful organic fresh produce, flowers, bread and an array of fast-moving restaurants. Sit at the bar and try the Lebanese, or at an outside table and have Moroccan tagine. But the best of all is the stall serving traditional French galettes. The line is always long but it’s worth waiting in to get a taste of the savoury crepes stuffed full of ham and cheese. 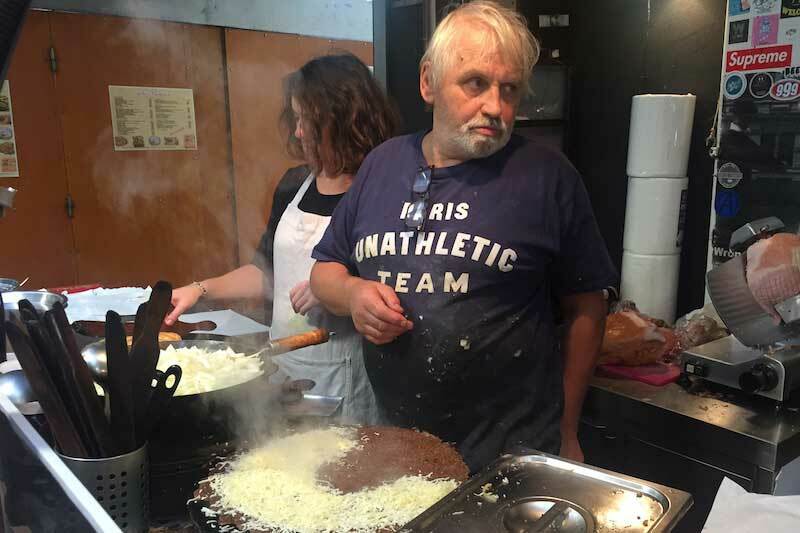 The legendary white-haired character who makes the galettes will keep you company with his thickly accented banter while you queue. It’s a complete Parisian experience. Poulette is a modern brasserie set inside a historic 19th-century space in the 1st arrondissement. Its deliciously simple versions of French cuisine update classic recipes using the seasons as inspiration. Its fit-out is intimate, and gorgeous mosaics cover the wall. The service is fun and relaxed. The steak frites (succulent and fatty, handcut and crispy) is perhaps the best in France. Try their cocktails too. 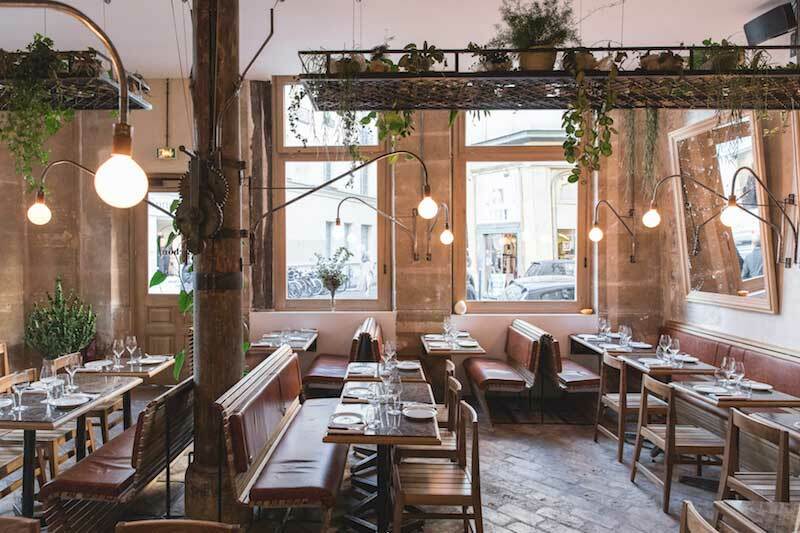 On the cobbled corner of Rue Charlot and Rue Poitou is Carbón restaurant with concrete walls, a smoky grill and a hidden bar. Carbón is focused around the power of fire to celebrate the most simple seasonal ingredients. The food is often burnt in the most beautiful way, carrots caramelised, beef crispy with a charcoal crust, fish scarred on the grill. 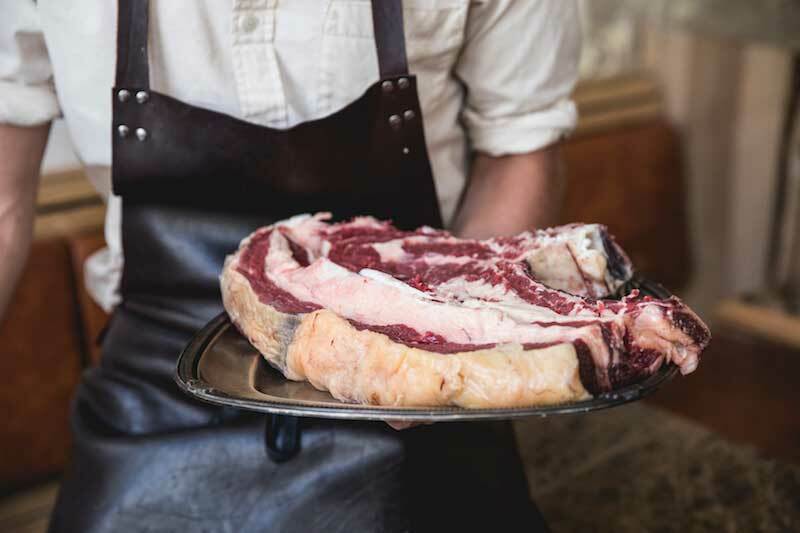 It’s a decadent and expensive menu, but worth every euro for the fat steak cooked over coal served with roast potatoes, the raw tuna and smoked duck, all served in a beautiful setting with wooden furniture and marble tabletops. Have dessert then head downstairs to the speakeasy LA MINA (Spanish for coalmine) for a cocktail. They’re just as good as the food. La Rive Droite, je t’aime. I hope you’re hungry.